A farmworker family profiled in 'Chasing the Harvest'—Maria Ayala Arroyo, Pedro Ayala Hernandez, and Guadalupe Ayala Arroyo—shares their story. Editor’s note: The following has been excerpted from a longer chapter featuring the Arroyo family: Maria Ayala Arroyo (46), Pedro Ayala Hernandez (55) and Guadalupe Ayala Arroyo (21). Read more oral histories like it in Chasing the Harvest by Gabriel Thompson (2017 Verso Press). Read our interview with Thompson here. Farmwork is often a family affair. Parents bring their children to labor alongside them in the fields. Workers learn about a job opening and tell their relatives, the word spreading quickly from uncle to aunt to cousin. If a crew sticks together long enough, it may find that most members are related to each other in one way or another. Such is the case for the crew of the Arroyo-Hernandez family. Maria and Pedro came to the United States in 1994, 10 days after getting married in Mexico. Their plan was to stay for a couple of years, save money, and return to Mexico to open a business. Then they had their first child, Guadalupe, and those plans changed. For more than two decades, they have traveled across the Coachella and Central valleys with a grape harvesting crew filled with siblings and cousins. When Guadalupe turned 16, she joined them in the fields, adding another family member. 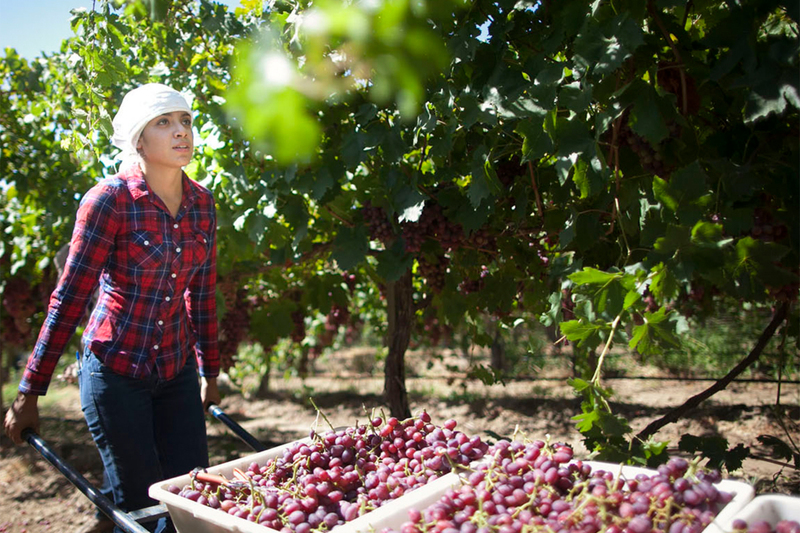 Guadalupe—whom her parents call “Lupita” as a nickname—is now completing her senior year of college at Cal State Long Beach; her parents continue to follow the grape harvest. Over several conversations, the family talks about the daily challenges of being a migrant farmworker family, the dramatically different opportunities presented to the younger generation, and how, no matter how much schooling one may have, a day in the fields will always be an important educational experience. Guadalupe: I was born in Indio in 1994. We lived in an apartment complex with over a hundred apartments. Mostly farmworkers lived there. It was a two-bedroom with a small living room, a small kitchen. My cousins lived there, and we’re about the same age, so we’d play with Barbies and normal girl stuff. Ride bikes. Go to the park. In the summer we lived in a labor camp in Edison. The cook lady at the camp was also my babysitter. She had a bell that she used to ring. One of my first memories at the camp was to walk around every trailer and ring the bell to let people know that food was ready. Everybody in the trailers worked for Giumarra. The camp was right in front of the Giumarra office, surrounded by vineyards. There was a trailer full of restrooms, and another trailer full of showers. And then there was a bigger trailer where they set up the kitchen, and that’s where they had benches where we would sit and eat. The family: Guadalupe Ayala Arroyo (second from left), Pedro Ayala Hernandez (third from right), Maria Ayala Arroyo (second from right). Our trailer was basically the size of a college dorm room. When I wasn’t helping the cook she would send me back to her trailer and I would watch TV or play with my dolls, something like that. When I was eight or nine, my parents decided we couldn’t live there anymore, that we had to find something better. Maria: One of my husband’s nieces took care of her, but there was nothing for the kids to do at the camp. They could only go out to play in the dirt, throw water at each other. There were no playgrounds in the camp, nothing. We lived for about six years in that labor camp, and Lupita’s sister Marlene was born. Then we learned that apartments existed in Arvin. Those apartments have beds. They have things that make living in them possible. Then Arvin’s apartments were demolished because they were too old—they were made of decaying wood. So the growers sent us to the labor camp in Shafter. Then my other daughter Jasmine was born. We lived there for three years before going back to Arvin. That’s where Lupita began going to school. Guadalupe: I went to schools in Indio, Shafter, and Bakersfield. They were completely different school systems, so I’d fall behind, because they were doing things that I didn’t know how to do, because I hadn’t learned them. When I went into middle school, I lost the electives I had chosen. I wanted to do soccer and art. I wanted to be part of the Associate Student Body program. The school didn’t allow me to because I was supposed to be there at the beginning of the year. When I came back, they gave me a new schedule and it was nothing like what my schedule looked like before. I was really upset. I talked to my parents about it. It took a little bit of convincing, because they didn’t know how it would work, because we had never been apart from each other. But eventually they gave in. They thought it was the best for me, too, for my education. Maria: Switching schools made life complicated. The credits can’t be transferred, and they lose everything and have to start from scratch, with the basic classes. It’s a huge problem. So one year, Lupita would go back early to Coachella with my sister, and then one year with me, and so on. My husband’s brother used to say, “I’ll be happy if my daughters finish high school.” And Lupita would say, “No mami, I want to keep studying.” She’s always wanted to go to college. Guadalupe: Ever since I can remember, both of my parents would always tell me, “You have to go to school so you can work in better conditions than what we’re working in.” So I feel like it’s something that they inculcated in me. That there was no way out but going to school. Maria: From the time she was in kindergarten, I went to the meetings of the migrant program, all the time. They told us about the help that we could get, the financial aid. The migrant program has helped me to be more awake. Because you’re basically asleep, you don’t know anything, and they kind of wake you up and tell you about these steps that you have to follow. That day, we sat down to have lunch in the field, and I was so surprised—the workers didn’t have any tables, or anywhere to sit. They just had to sit in the shade near the grape vines on the ground and eat. I think that was one of the biggest “wow” moments that I had that day, when I saw my parents having lunch on the ground. It was probably around two in the afternoon when my legs started getting really tired. And since I had finished packing the grapes that I had, I was like, “I’m just gonna take a seat.” My cousin was the mayordomo. He saw me and he’s like, “You know you’re not supposed to do that. You can’t sit down on the job.” I was kinda scared, ’cause I was tired at that point. I just wanted to sit down—it was hot. That first day was super life-changing, eye-opening for me. Sometimes when I used to stay home I wouldn’t clean the house, and my mom would get really mad at me and be like, “Why haven’t you cleaned?” And I’d make an excuse, because I was watching TV or something. On that first day, as soon as we got home, I made sure my sister cleaned. I knew how tired my parents were from working ’cause I had to go through it myself. It made me value my parents a lot more. I had no idea how hard my parents’ work was. I mean, I knew it was hot, but that was about it. Pedro: How could I forget that first day? We worked for a little bit, and then I sat down with her and told her, “You see, this is the work.” And she liked the work. Like us, she’s a hard worker. We don’t wait around to see if other people want to work—we’re going to do the work that’s asked of us. Guadalupe: I’ve worked six summers in the grapes. Even after I started college, I still came back to work each summer. My parents would keep most of the money I made—they’d give me a $100 allowance every week. And they’d tell me that I had to purchase my own uniform, my own school supplies, and everything with that money. When I arrive in the fields, the first thing I do as a packer is to wipe down the table and grab a scale. My parents take the wheelbarrow along with five trays, and go inside the grapevine and start picking the grapes while I grab the packing materials. We pack different types of boxes. Sometimes we need bubble wrap, sometimes we need lids. It depends on what type of box we’re packing on that day. After we pick all five trays, my dad sets the trays on the floor and puts two trays on the table and I start packing. My dad takes more trays inside the vines, so he and my mom can continue picking. If I’m done packing before he brings the next wheelbarrow full of grapes, I go inside and help them pick. Just back and forth. A box is supposed to weigh about 22 pounds. You knew if you were good or not based on how many boxes you packed in a day. Like, “Oh, we made 100 boxes?” It depended a lot on the grape. If the grape was really good, we would make almost 200 boxes a day. When they were OK, we would make 150, 120. When the grape was semi-OK, 70. There was a day when the grape was really, really bad, it was podrida—rotten, nasty—and we made like 20 boxes that day. That day was horrible. They divide you into groups of two or three, and they give you a number—that’s how they’d keep count of the boxes. We were always number one. We like to be on top. My parents are known for being some of the top workers in the crew, so they thought that with me starting with them, I was gonna slow them down. But they were really happy because all three of us came out on top, even on my first day. There was this lady called a chequeadora, the checker. Every time the truck is gonna come pick up the boxes, she’d count the boxes and write them down on her notebook. And most of the time I would write them down too, ’cause my mom would tell me to. She said that sometimes they’d miscount them, steal boxes, so she’d make sure that I wrote them down. Honestly, I think like 75 percent of the crew was family. Aunts, uncles, cousins, second cousins. Somehow we were all related—or if they weren’t related to me, they’re from the same place in Mexico where my dad’s from. Or they’re related to my uncle, because my uncle’s wife is related to them. Sometimes I find out some people I’ve worked with aren’t really family, but I’ve been calling them my uncles and aunts all my life. Guadalupe: I really enjoyed high school. I was involved in so many things. I went to Indio High School and I was the associate student body vice-president all four years. I played soccer, I was a mentor in Big Brothers Big Sisters, and part of a forum called Young Women Leaders. I feel like I had help everywhere. In the Boys and Girls Club they had workshops on financial aid, they had workshops on when the deadlines were for University of California and Cal State schools. I was part of the Migrant Program and they offered free tutoring when we came back from Bakersfield and were falling behind. I was also part of Upward Bound at College of the Desert. They focused on sending us to college. We visited UC Berkeley, Stanford, Cal State Sacramento, and Fresno. And then we came to Long Beach. That’s where I found out about the [College Assistance Migrant Program] CAMP program, and that it was offered only in Long Beach and Cal State San Marcos. I thought, “Hey, there’s the beach, it’s two hours’ away—not too close to home, not too far away.” It was offering the most money, but honestly I feel like the CAMP program was the thing that made my decision clear. Because I was going to a whole new city, a whole new place, and I wasn’t sure what I was gonna be doing. But at least I’d have people with similar backgrounds that I’d be able to hang around with. Maria: In 2013, we drove her to the university for orientation. My husband can’t read—that was our first fear. How were we going to drive along these highways when he didn’t have any idea what the signs said? But by then, because of the migrant program, they’d already taken her to visit the university. And she is very intelligent, thank God, so she learned the exits and entrances really fast. I remember that day well. We were ready to go and she asked her dad to give her the keys to the truck. He looked at her as if saying, “Are you crazy or what?” “Give them to me,” she said again. She already had a license. And he had to agree. “You’ll get angry if I tell you to take this road, go here, take this exit,” she said. “So I’m going to drive.” And she took the car and drove all the way there. Pedro: Maria’s still not over it, because she doesn’t go to sleep when she’s waiting for Lupita to come home. Guadalupe: I was kind of upset that my parents weren’t able to actually drop me off when we had to move into the dorms. They were working and they had already taken a day off when we came to the CAMP Orientation, so they couldn’t ask for another day. But I was excited. I was gonna live so close to a beach, and in a new city. And I was excited because I knew my roommate. We’d been friends in high school. I hated the food at the dorms. That was the biggest culture shock that I had. I was used to my mom’s homemade tortillas and homemade salsas. They had what they called quesadillas, and they had yellow cheese! The tortillas were hard; they were gross. When my mom made quesadillas, they were with mozzarella cheese and homemade tortillas. The school had enchiladas and they didn’t taste like enchiladas. I got really homesick my first semester at college. I wanted to get a car so I could visit my family, but I needed money. During winter break I went home to Coachella and worked in the strawberry fields. I remember going in the first day and thinking, Oh, this isn’t so bad. We started at 5:30 a.m. and got out at 4 p.m. The next day I couldn’t get myself up. I was so sore from being on my knees the entire time. Strawberries are really horrible. Grapes seemed like a piece of cake compared with picking strawberries. But I went back to work. I wanted to get a car, so I needed money. I had to continue working no matter how sore I was or how bad I wanted to stay in bed. We made nine dollars an hour, or eight something. And I did get a car. Pedro: I didn’t like to see her working in the strawberries, down on her knees. It’s the kind of work where you are stooped over all day, really fast work. I’ve picked all kinds of fruits, and it’s one of the hardest to pick. Maria: It was January, very cold. When we got to the fields of strawberries they were white, covered in ice. It was really sad to see her, sleeping warmly in the bed, and have to wake her up and see her get into cold car, still covered in a blanket. But she said, “I need money,” and so she did it. That first year was very difficult for her. During the weekends she came home and I’d fill a Tupperware with rice, beans, and chicken—food for the week. But then she told us that she had a food plan and she had to use the money or she would lose it. Little by little she realized that she had to eat more of the food that they offered. Thank God she has managed to survive. Guadalupe: The CAMP program made me feel welcome. There’s a specific building on campus, the CAMP building. When you walk in to the first floor, there’s only CAMP people. They have a lounge for the students, a computer place, so most of the time you’ll find a lot of CAMP students studying there, waiting for their next class to start, or just chilling there ’cause they want to be there. I’ve met people from Bakersfield, Wasco, Salinas. One of my really good friends is from Watsonville. They come from all over the place, and most of them have worked in the fields, so it’s nice hearing their stories. We call each other the CAMP familia. Guadalupe: This has been the first year that I haven’t gone to work with my parents during the summer. I was employed at the university and they offered me a full-time position over the summer. I started working in October in the Foundation Research Building, receiving donations for the university and inputting them into a database. I kinda have to think about the future now, since this is my fourth year. I might be walking in graduation this spring, or I might not be walking—it depends on if I’m allowed to go over the limit on my units, ’cause I’m double majoring in psychology and human development. I know that I don’t wanna stay here in Long Beach. I wanna go back home. I have three siblings now—two teenage sisters and a younger brother, who is six. Maria: I don’t have hopes that anything will change, like that she’ll graduate and then help us. No, because her education is for her. She’s become an accomplished person, someone who has overcome a lot. And her sisters will see her, that she’s not following a path to the fields but doing something else. Pedro: For me, it was important that she knew what work in the fields was like. More than anything, I advised her to study and that if she kept studying, she’d have a better life than we had. “We’re getting older, we’re going up to heaven someday,” I told her. “But if you study, you’re going to have a great future.” And up to this very day, that’s what she’s done. And she’s studied so much! We’ll see what happens. Guadalupe: I’d like to work somewhere where I can help students like me. There were various groups that helped me; I’d like to give back. To help students like me reach their goals of going to a four-year university. I’m not sure exactly where I would be able to do that, but I know I want to go back home and do something similar to that. My parents are excited that I want to come back to the valley. We’re desert rats. We hate the desert but we still go back. Photos by Joseph Philipson for CSU Long Beach’s Beach Magazine. Thanks for sharing the story of the Arroyo family. What a humble hardworking group of people that work so hard. The story has made me feel more grateful than ever for all that I have and for the amazing food these people make possible for us. Thank you so much to the Arroyo's.